Most of the time, arguments tend to bring out the worst in us. In order to put forward a point, we sometimes cross the line and go too far with our words. 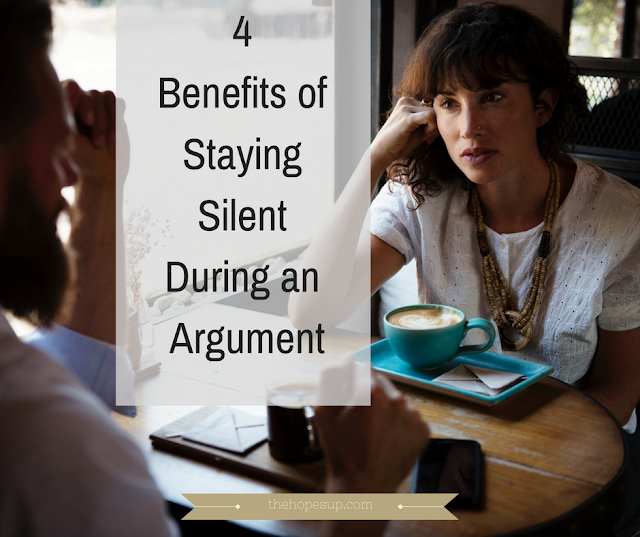 Usually, a lot of shouting, unnecessary blabbering, and verbal attacks take place during arguments. And aggression from both sides only makes things worse. At that moment, winning the argument anyhow becomes important. Both sides keep fighting with each other to prove that they are right. Silence in this situation can be extremely beneficial to cool down the heat a bit. Most of the time staying silent in an argument will have a greater impact on the person in front of you than constantly yelling at them. 1. Less chance of feeling guilty afterward. When you’re angry, you tend to lose perspective and say a lot of unkind and unpleasant things. You don’t even have control over the words coming out of your mouth. Most of the time you don’t even mean them, but it does leave you with a bad taste and guilt afterward. Sure, you can always apologize and try to mend things out, but a lot of times, you can’t take back the things you have said, and you end up feeling really awful and embarrassed for your behavior. It’s better to avoid saying anything altogether to resist the urge to say anything mean to the person in front of you. 2. Not escalating the situation further by bringing up past fights or saying something inappropriate. During an argument, it’s very tempting to bring up past fights to defend yourself. However, doing so only makes things more complicated and, as a result, the argument intensifies unnecessarily. Constantly digging up past experiences will make the relationship sour and distressing. When you attack, the other person will also react to defend themselves, or they might counterattack to win the argument anyhow. During the argument, try to stay on the topic and don't deviate from it or escalate the fight any further. Only say as much you think is absolutely necessary or keep your mouth completely shut and try to resolve the argument rationally and calmly. 3. More time to choose the right words to put your point forward. Silence gives you time to think through the situation in a broader and a better perspective. As compared to constantly arguing, remaining silent keeps you calmer due to which you get the time to frame your sentences carefully, which enables you to put forward your side of the story in a coherent way. You'll thank yourself for not saying anything negative, mean or plain stupid. Stay patient, respond positively and calmly and the argument will resolve in a much better way without leaving a negative feeling. 4. More time to understand their point of view. Try to listen and understand their point of view first. Absorb all the bitterness you can and then proceed to talk about your feelings at the correct time. Anger makes us react impulsively, and it's very easy to get swayed by emotions. By remaining silent, you give yourself the time to control your emotions and stop yourself from acting out. As a result, the argument gets resolved more quickly. Silence provides you with the time to reflect, and understand the root cause of the issue. This allows you to resolve the argument in a better way. However, do remember that being silent during an argument is not the same as being entirely emotionless. Try to keep your body language as open and warm as possible. Even when you’re silent, a positive body language can help the other person to calm down. Your motive should not be to bottle up your feelings and let the issues pile up. You should focus on resolving the argument as soon as possible and with the right attitude. There’s no point in continuously shouting at each other, attacking each other and not reaching any conclusion in the end. Sometimes, you just need to be more considerate towards the other person and listen to them in order to calm them down and end the argument. In what other situations do you think silence is beneficial? Share with me in the comments below. if you enjoyed this post, don't forget to share it with your friends. Thanks Mitali :) I'm happy you found your way to practicing patience. Controlling anger definitely paves the way for more happiness and peace. Well, you did your part and apologized. We can't control other people's reaction anyway and sometimes it is just better to give them space to figure things out. I really hope your relationship with your co-worker improves. Good luck!